Are the Wings ready for youth movement? In 26 games thiis season, Mikael Samuelsson has one goal and two assists. 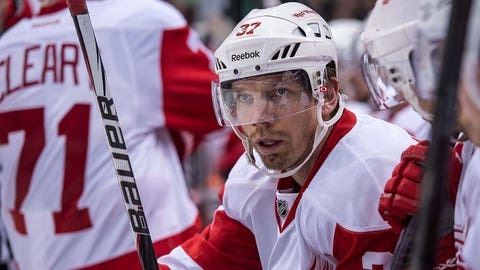 If everything goes according to plan, Mikael Samuelsson will clear waivers at noon Sunday and be assigned to the Grand Rapids Griffins of the AHL — or maybe not. "That’s an option; we got to make a roster move (for Johan Franzen)," Red Wings GM Ken Holland said Saturday. "It could be Sammy or one of the kids." "I said to Mike Babcock, ‘Dress the 12 forwards you think give us the best chance to beat the Florida Panthers.’ That means if one of the kids isn’t in the lineup, he’ll be sent to Grand Rapids instead of Samuelsson. "I don’t want the kids here if they’re not in the lineup." The Wings play host to the Panthers at 5 p.m. Sunday, and many believe that the "kids" — specifically, Tomas Jurco, Riley Sheahan and Luke Glendening, all of whom have AHL options — will be in the lineup. "Some of the kids have played pretty well," Holland said. "We got good competition. We’re starting to get healthy,"
But he also reiterated: "They’re either in the top 12 or they’re in Grand Rapids." In all likelihood, Samuelson will be sent down, but Holland’s comments give you an insight as to where he’s coming from with the Wings’ young players. During their glory days, it was near impossible for a prospect to make the Wings without serving a prolonged apprenticeship in the minors. There were a few exceptions, such as Henrik Zetterberg, but for the most part, Holland wants the Wings’ youngsters to be "overripe" when they reach Detroit. This year, however, a rash of injuries and slumping veterans have forced the Wings to abandon Holland’s comfort zone and call up several players from Grand Rapids. They have responded well, and I’m pretty sure that every prospect has exceeded expectations. They’re either in the top 12 or they’re in Grand Rapids. When you’re as good for as long as the Wings have been, an apprehension sets in with your prospects. You feel more comfortable with veterans because they don’t have a learning curve. An established player is a known commodity; a kid is a kid, which means they’re totally unpredictable and prone to mistakes. Samuelsson’s signing as an unrestricted free agent two summers ago is a perfect example of the Wings’ philosophy at work. When Jiri Hudler signed with Calgary, the Wings had no faith that any of their prospects could replace him. So they opted to bring back Samuelsson for two years at $6 million. They believed that he would match Hudler’s numbers for the length of the contract. It hasn’t happened. Samuelsson spent most of last season off the ice with a myriad of injuries. This year, though healthy, he hasn’t been able to find his offensive game. In 26 games, Samuelsson has one goal and two assists. He was a healthy scratch with regularity because Detroit’s younger forwards have passed him on the depth chart. Waiving Samuelsson was easy and expected. Now, with the Wings starting to get healthy, more roster moves will have to be made. Fans may clamor for veterans Daniel Cleary and Todd Bertuzzi to undergo the same fate as Samuelsson. But that’s a remote possibility. Expect Jurco, Sheahan and Glendening to rejoin their Grand Rapids teammates at some point. This season might have forced the Wings to alter their thinking towards their kids, but in the long run, their attitude of veterans over kids hasn’t changed.